Design Registers | View by object | Ceramic shapes | Plates | Pattern for a plate in black. You are here: Home > Exhibitions > Design Registers > View by object > Ceramic shapes > Plates > Pattern for a plate in black. 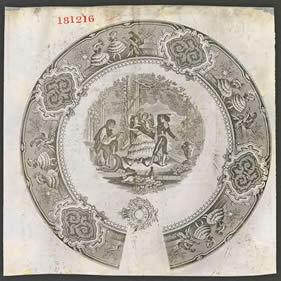 181216 - Hope & Carter - 10 November 1864 - Pattern for a plate in black. This pattern includes an example of a Hope & Carter printed mark including [Pattern name] DANCERS.